Claude E. Roberts, age 88 of Axton, VA passed away Saturday, January 12, 2019 in Stuart, VA. He was born November 30, 1930 in Kentucky to the late Claude Roberts and the late Essie Elsia Roberts. Claude was married to the late Mildred Witcher Roberts. 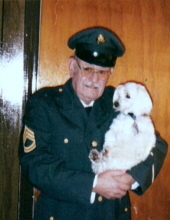 He proudly served his country for 26 years during the Germany Occupation, Korean War and Vietnam War before retiring. Claude was a member of Carroll Memorial United Methodist church. Mr. Roberts is survived by his caregiver, Evelyn P. Burgess; an adopted daughter, Linda Burgess; many nieces and nephews and a special little sis, Sylvia Roberts. In addition to his parents and wife he was predeceased by two sisters. The family will receive friends 11:00 am till 12:00 noon, Wednesday, January 16, 2019 at Carroll Memorial United Methodist Church, 403 Axton Rd., Axton, VA 24054. Chaplain Drew Purcell will officiate the funeral services after the visitation. Military honors to be performed by American Legion Post 325 at Highland Burial Park. In lieu of flowers memorial donations may be made to Carroll Memorial United Methodist Church, 403 Axton Rd., Axton, VA 24054. Norris Funeral Services, Inc. and Crematory, West End Chapel, 511 Church Ave. Danville is serving the Roberts family. Online condolences may be made at www.norrisfuneral.com. To send flowers or a remembrance gift to the family of Claude E. Roberts, please visit our Tribute Store. "Email Address" would like to share the life celebration of Claude E. Roberts. Click on the "link" to go to share a favorite memory or leave a condolence message for the family.